Copperheads get their common name honestly – there is a rusty, copper-colored patch on the top of its head. The top of a young black rat snake’s head won’t have this rusty patch. The head of an immature black rat snake is basically patterned like the rest of the snake’s dorsal (back) – that is dark splotches on a lighter background. The copperhead is a pit viper. It has a broad, triangular or wedge-shaped head. There is an actual pit between the eye and the nostril but this feature may not be obvious with just a cursory look. However, the triangular head and elliptic pupil are quick giveaways. 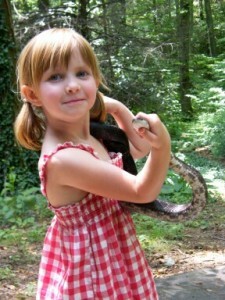 The rat snake has an oval shaped head and large, round pupils. There is another difference regarding the head that’s pretty easy to see once you learn to look for it. The copperhead and other pit vipers have a small smooth, shiny plate over the nose that extends back just pass the eyes. The rest of the triangular head is rough or scaled. On rat snakes and other non-venomous snakes, this shiny plate covers the entire head. And while both have dark patches over a light background there is a distinct difference in the pattern. The dark splotches on the dorsal of the young rat snake are square looking. They are broader on the top of the back and narrower on the sides. The copperhead’s copper-colored blotches are narrower on top and broader on the sides. They’ve been described as hourglasses draped over the back. And there should be no problem distinguishing immature copperheads. They have bright, yellow-tipped tails. The splotchy pattern continues on the tail of the young rat snake. For some reason North Carolina leads the nation in copperhead bites. It may be because there are few poisonous snakes in North Carolina and people don’t take time to look or because copperheads are, in fact, pretty common and like sheds and woodpiles and the fact that prey like mice are attracted to human habitation, so they are often found in proximity to people. But if you learn how to recognize copperheads (and other poisonous snakes) and give them their space there should be no conflicts. Snakes can basically only strike with authority within a distance of just over half their total body length. So learn to recognize snakes, teach your children to recognize snakes and adhere to two simple caveats – 1) never try to touch or capture any snake you can’t positively identify and 2) always give poisonous snakes and/or the ones you can’t identify a wide berth – and enjoy your serpentine summer. Of course, there’s no mistaking the guy in the photo. But when we looked closely at this four-foot plus black rat snake, we could still see the faint splotchy pattern on its back. It must have been a young adult.